Welcome to our community! That is such strange problem. I've heard some people say that maybe the meters are just a couple of MB off, but 8 - 13 is a wide gap. Could you post screenshots or send them to me in a private message? Also, I was running diagnostics on your account and noticed that your video-enabled doorbell has uploaded over 12GB in the past week or so. Uploads do count as data usage, so if you weren't aware I figure it may be beneficial to lower the frequency of uploads or video quality. photo 1 photo 2I am sorry but I did reply via the email that was sent. I have again attached the photos. I continue to find discrepencies with the usage meters. 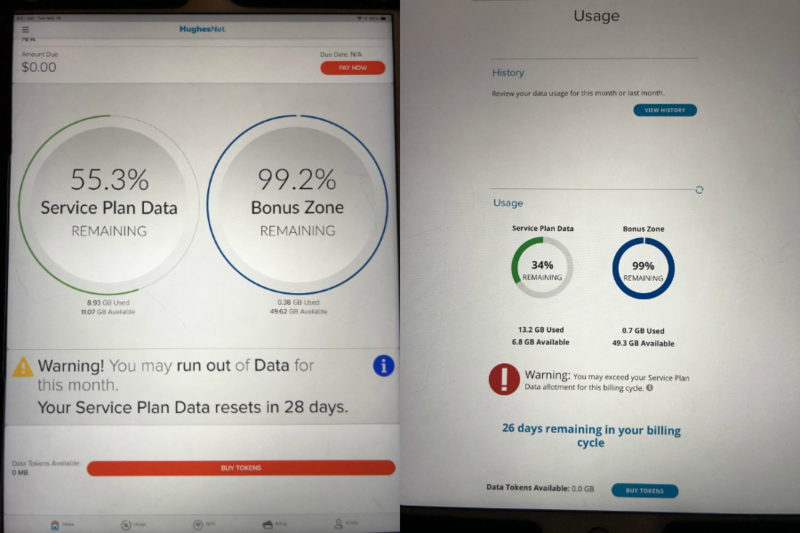 There are some days when the meter shows that I have no data in the service plan or the bonus plan. Two days ago I used the last of my free tokens, but it never registered in my meter. I know that our Nest camera uses data, however it is only for about 30 seconds at a time. It is no worse than downloading a movie, which we do not do. I am just very frustrated by this. Thanks for these pictures. If there's indeed a discrepancy between the Usage Meter in the mobile app and online in the Support Center, we have no problem escalating to our developers to address. If we had a shot of the Usage Meter on the mobile app and in the Support Center taken right after another, or even in the same shot, to show two significantly different readings, I will escalate this for you. See up there how it says 18 GB? That's where your data tokens will go. If you had 0 Anytime Bytes, and you used a token, your Data Tokens Available will increase by however much that token is, but Anytime Bytes will remain at 0. However, your speeds will be restored since you will now be running on token data until that is depleted as well. These two pictures were taken at the same time, so that is the problem that I orginally reported. At that moment the two systems displayed different information. Thanks for the clarification. Thank goodness for metadata; I checked the properties of your pictures and they definitely show they were taken one minute apart. I did some investigating and I do see reports of data allowances for some customers not resetting/reporting properly on Mar 19, the date of your pics. I'm very sorry for this inconvenience and alarm. I've sent you complimentary tokens for the trouble, so you might receive an e-mailed order confirmation for the free tokens. Thank you again for bringing this up so we could get to the bottom of it. If you have any other concerns, feel free to reach out again, we're here to help!